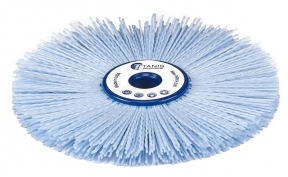 Our Narrow Face Wheel Brushes are used for cleaning, polishing and deburring recessed applications such as small openings, slots, machined grooves, fine deburring on medical instruments and gear splines. Our CeramiX® Narrow Face Wheel Brushes feature an innovative 3M mineral grain which provides enhanced cutting action up to 3-5 times greater than traditional abrasive filaments. Narrow face brushes are also available in silicon carbide, an abrasive grain widely used industrial applications and preferred for finishing ferrous metals. We have over 50 standard Abrasive Nylon Wheel Brushes with various specifications to meet any of your application needs. Sold separately, we have wheel brush adapters for mounting our abrasive wheel brushes onto smaller shafts.